Not as bad as most people make it out to be. It is a quite enjoyable set of songs with the classic yes style and a modern sound. This is probably the album that sounds closest to Yes since Tormato, though it still is barely "prog" and sounds quite a bit commercial and overproduced sometimes (mainly the vocal harmonies). I believe that the presence of Steve Howe helps this record sound like Yes, as Rabin's songwriting was focused on pop and hard rock. Speaking of Steve Howe, he elevates Open Your Eyes from a mediocre album to a good one. The first 3 songs are pretty good. New State of Mind is an effective opener: A song with an interesting and catchy guitar riff and energetic vocal harmonies. The song is slightly overlong and a bit aimless and incoherent, but it mostly enjoyable regardless of those two issues. 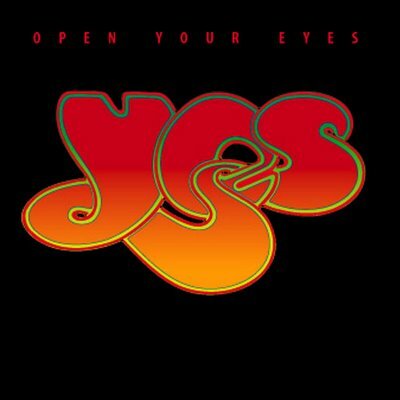 Open Your Eyes is a decent pop number with some good, if overproduced, vocal harmonies and some good Steve Howe moments. Universal Garden has a great acoustic guitar solo at the beginning, with floating and shimmering synths backing it up in a new-age fashion. While the choruses are slightly irritating with high-note vocal harmonies and a "mind-drive" sound, the verses are quite beautiful and features nice vocal melodies. After the first chorus, there are gorgeous acoustic guitars and synths again, this time even better. The song ends with Steve Howe solos. The rest of the songs are mostly decent, though a drop of quality after the great "Universal Garden." We have the No Way We Can Lose which is mostly overproduced vocals which are a bit irritating. As always, there is some good guitar playing scattered throughout but it doesn't redeem the mediocrity here. Fortune Seller starts a bit funky and upbeat with the nice rickenbacker bass. Overall an ok happy tune with nice guitar playing and catchy vocals (though they still are overproduced). Man on the Moon is a catchy pop tune with a string riff. Nothing special, but not bad. Wonderlove is a nice yesballad, with many musical details to explore, and vocal harmonies that sound better here than in most of the album, though the song suffers a bit from having a long duration. From The Balcony is just Jon singing and Steve Howe playing nice acoustic guitar. It sounds incomplete as it sounds more like an introduction to a song rather than a song itself. I don't really like the song. Love Shine is easily the worst here: a boring and painful AOR song that is at least as bad as 90125/Big Generator at its worst. The vocal arrangements are pathetic at best and there is no great guitar solo to be found. Somehow, Someday is nothing new as it sounds like a typical average yes song and not much different from the music in this disc. The Solution is another highlight, with catchy hooks (like the chorus), nice vocal harmonies and good musical arrangements with many many details in the background. The best part is at minute 3, with a beautiful and powerful 3/4 symphonic riff and Steve Howe soloing wildly. I don't know why the solution has about 18 minutes of near-silence with some vocal harmonies featuring familiar melodies popping out every now and then after the song is finished. It's quite pointless, so I skip it. While I don't really recommend this album, it is not as bad as other yesalbums I have. It has nice musical arrangements most of the time, good guitar playing, the signature yes sound, and some great hooks. I think that Universal Garden and The Solution are some of the best tracks written by Yes during the 80s and 90s.